Albion Mill (erected near Blackfriars Bridge in London in 1786, this important flour mill attracted much attention until it burned down in 1791). The Birmingham Commercial Committee (Matthew Boulton played an active part in its meetings and in its review of the Copper and Brass Trades. He took over from Samuel Garbett as Chairman in 1790. There are minutes, notes on proceedings, a full list of members of the Committees, and important papers on the protection of manufacturing interests and pricing policy). 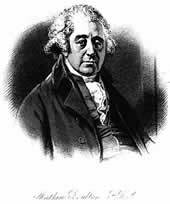 Josiah Wedgwood; the papers show that Matthew Boulton was regularly involved). Boulton and Watt’s industrial companies and business empire (including Early Accounts and Agreements. This material demonstrates the links and co-operation between men of science, merchants, manufacturers and entrepreneurs collaborating to have a concerted voice on all matters concerning prices, internal and external trade, standards, trading restrictions, patents and petitions). Canals (Boulton was very involved in building up the network of canals around Birmingham). Copper (Boulton’s letters and notes on the copper trade and on copper companies). The Contest and Cornish Miners (involving patent disputes with the Hornblowers and other infringements). Iron Trade (Boulton’s proposals, notes and letters). Soho House (documents on the layout and organisation of this property). The Soho Foundry and Manufactory (papers on the centrepiece of the Boulton and Watt empire). Steam Engines (papers on the different types, designs, new improvements and methods of use of Watt’s Steam Engines along with details of Agents employed between 1819 and 1839). the Plate Company for the period 1796-1848. Buttons gilted and plated, 1795-1808. Silk Reels East Indies Company, 1779- 1785.
the Trade Accounts of Boulton, Watt and Co for 1794-1842. A box of biographical material contains lots of useful material covering the contest with the Cornish Miners as does the subject file on this topic. There are also biographical notes by James Watt and James Keir, an article about Matthew Boulton in the European Magazine and London Review (September 1809) and other newspaper articles and illustrative documentation. The files on Birmingham reveal a great deal of detail about Boulton’s social life and philanthropic activity. There is material on the Birmingham Society of Arts, the Theatre, the Birmingham Workhouse, the General Hospital, the Dispensary, the Police, the Overseers of the Poor, the Philosophical Society, along with Minutes of Birmingham Town Meetings (1790-1797) and significant material on the Birmingham Riots.